Oriza L. Legrand's latest perfume has a strange name — Cuir de L'Aigle Russe.1 No, this is not the scent of a 'Russian' eagle's tanned skin...I assume we're in "Royal Leather" territory. Oriza L. Legrand is one of my favorite new fragrance houses of the last several years. So many of their perfumes are on my to-buy list that I'm paralyzed with indecision and will probably buy none. After my first sniff of it, Cuir de L'Aigle Russe also went on this weird active-but-inactive to-buy list. Cuir de L'Aigle Russe begins with a dry lemon-bergamot accord; I detect fuzzy geranium leaf with a hint of rose, warm immortelle snuggling with cardamom and a burst of non-species-specific floral indoles. There's a lovely styrax note in Cuir de L'Aigle Russe's heart: imagine vanilla-bean incense burning in the room. An old-style, smooth-as-satin leather aroma is the lead-in to the perfume's base. This leather is tame (and clean) enough for babes and makes me imagine perfumed-leather "dust." Many of Cuir de L'Aigle Russe's notes are talc-y-silky, not full-on powder-particles forming white scented clouds in the air. But: if you think Molinard Habanita is too powdery, you'll probably think Cuir de L'Aigle Russe is, too. I love talc-y and powdery perfumes, and I've always found powdery leather perfumes delightful; and wearing them always makes me feel young...and happy. Even if you're leather and/or powder phobic, give this sweet perfume a try. 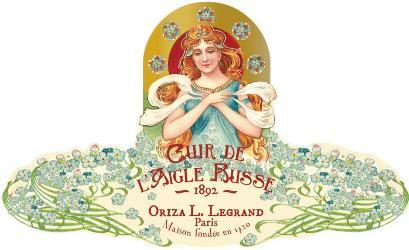 Oriza L. Legrand Cuir de L'Aigle Russe Eau de Parfum is unisex and has good lasting power ($165 for 100 ml). For buying information, see Oriza L. Legrand under Perfume Houses. 1. Listed notes of bergamot, coriander, rose, lavender, davana, cade, geranium, immortelle, cardamom, styrax, patchouli, labdanum, incense, musk, tonka bean, sandalwood, amber, vetiver. Fantastic review – you described the scent so beautifully. Which of their perfumes would top your ‘to buy’ list? Hard question! I guess I’d choose Foin Fraîchement Coupé or Chypre Mousse? Don’t even get me started on the soaps and candles! Oriza are a great company producing high quality perfumes and this one sounds lovely – my favourites are Chypre Mousse which is a proper mossy chypre like NOTHING else on the market – stunning – and I have a fb and my other fav is Reve D’Ossian which is a spicy aldehyde with lots of high quality Frankincense – I also have a fb of this……on my to get list is Heliotrope blanc which is a comforting baby powder heliotrope – beautifully done. And this new leather is making me wanting…..will try to get a sample soon. BTW they are brilliant at sending samples – reasonably priced and shipped worldwide. Good to know – thanks, kate! Yes, many thanks. The sample deal is very attractive. Thank you Kate. This line sounds delightful- I mean, a real oakmossy chypre?! I’ll be getting these samples. This is a lovely, informative review, Kevin. I’m so going to check this line. Thank you. And of course, I posted in the wrong place. Sorry, Kate. Kate: I haven’t had the chance to try the heliotrope yet…but it’s on the list. I know what you mean about really appealing lines and not being able to decide! The other drawback is that when you finally do pick one, you will most likely forever wonder if you should have picked that other one instead. The only solution is to buy them all! In my case, I finally bought OJ Champaca, and I keep feeling I should have bought Taif, but I suspect I’d feel the same way in reverse had I bought Taif. With their overdose of Iso E Super, the OJs smell too similar (to my nose) to own more than one, but it sounds like the Oriza L. Legrands may be more diverse. Noz: yes, the Legrands are much more diverse…I will probably end up getting at least one…but nowhere NEAR my decision yet. I definitely need to explore this line. I have a similar problem with Serge Lutens. I could own nearly every export fragrance but which one could I possibly preference? Even at discounted price it’s tough to choose. Coumarin: it’s VERY difficult to choose if a line appears out of nowhere and releases many fragrances in just a few years…that’s when I “stall” and can’t decide. Very enticing review – I’m tempted to get their discovery set now.